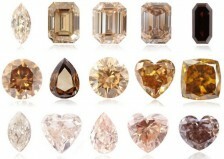 The Champagne Diamond brand was created by Rio Tinto and its subsidiary Argyle as a better way to promote brown diamonds. It was one of the best campaigns ever run with color diamonds. 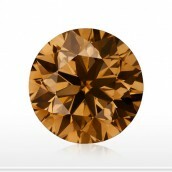 The brownish stones are found quite regularly, relative to all other colored diamonds. The Argyle mine in Australia, which is known as one of the top producers of brown stones, managed to significantly upgrade the luxury of the color with this promotion. 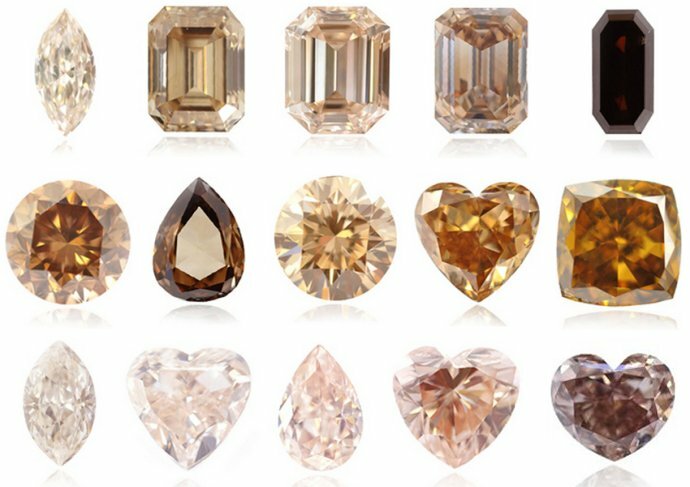 A number of years later, LeVian began promoting the same color under the name Chocolate Diamonds, which only increased the amount of attention these beautiful stones already had. These goods have a warm, darkish color and together with the price point, these stones are considered very attractive and used quite often for colored diamond jewelry. 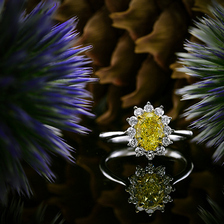 A nice Champagne stone sells for about 30% less to a comparable Yellow diamond and costs half of a white diamond. Fancy colored diamonds are actually well known for the extreme rarities and, in many cases, their high price tags. However, specifically with champagne colors, as a result to the large quantities available, they are actually priced significantly less than their colorless counterparts. Often sought after by individuals looking to add a splash of glamour, Champagne diamonds make for a luxurious look while keeping a modest appeal. They compliment a wide variety of skin tones and add a warm tone to the look and feel of the stone. Champagne stones can be found with a single color and one, two, or three of the following overtone colors; Yellow, Yellowish, Pink, Pinkish, Orange, Orangy, Greenish, Greenish Yellow, Purple, and Reddish. The popularity of champagne diamonds in general is rapidly increasing. Still, different people prefer different shades. The different color intensities found with champagne stones are Light, Fancy Light, Fancy, Fancy Deep and Fancy Dark intensity grades depending on the secondary colors of the stone. Similar to all color diamonds, there is a wide scale of fancy shapes found. Most diamond polishers aim for the shapes that display the color best, such as a Cushion or Radiant shaped stone. However, the more unique shapes such as Emerald or Rounds can also be found. Due to the variety of color tones available, there is no one setting that fits all. Furthermore, because the contrast between champagne and colorless goes so well together many prefer to add a nice halo or even make it a three-stone ring. Below are a few examples of champagne diamond engagement rings we have designed in the past. The metal used depends entirely on the color of the stone. The Leibish & Co. jewelry designers will often use a combination of different colors of Gold in order to acquire a beautiful contrasting affect, which will then maximize the color seen in the stone. Setting a colored diamond should be done only by those jewelers with experience. The main goal is to focus on the color and contrast it as best as possible to maximize the potential affect of the natural stone. Champagne diamonds are often put in the spotlight. Celebrities like to display their colored diamond jewelry, and Champagne colors are developing quite a trend. A few examples are Kristen Bell who received a 3.00 carat, emerald-cut, fancy colored champagne diamond with platinum and tiny white diamond accents. Shawna Thompson who presented her “Champagne Bubbles” diamond earrings, and Sheryl Crow who wore a Champagne cougar diamond ring at the 2012 Tony Awards. For a little splash of glamour to add a little spice into your next piece of jewelry, consider a champagne colored engagement ring to really steal her heart.